Royal Caribbean’s Voyager of the Seas has been treated to a revamp and revitalization ahead of the new cruising season. The 15 year old ship has been given a face-lift and a number of new features, including the region’s first FlowRider, an on-board surfing simulator. The multi-million dollar investment sees Australia’s largest ship upgraded with a range of features found on Royal Caribbean’s Quantum and Oasis Class ships. From new cabin features to state-of-the-art cinema facilities, passengers aboard the Voyager of the Seas will have access to even more fun and luxurious amenities than ever before. Experience the perfect point break, even in the middle of the Pacific Ocean, on the FlowRider surf simulator. The 12 meter simulator gives you the chance to practice your surfing, wakeboarding and boogie boarding any time of day. Private lessons are available for beginners or those whose skills need a little tuning up. The adjoining stadium seating also offers the perfect position to watch challengers tackle the waves. Enjoy beautiful views of the ocean from an interior cabin with virtual balconies. The 80 inch screens on your cabin wall streams live footage from the exterior views of the ships, giving you chance to watch the relaxing ripple of the beautiful seascapes from the comfort of your bed. The virtual balconies on the Voyager will be amongst the first in the world alongside the Quantum of the Seas, also setting sail in November. The Voyager of the Seas’ revitalization has also seen the ship enjoy increased and improved dining options with new eateries added, including Izumi Japanese Cuisine, Chop Grille steakhouse and Giovanni’s Table Italian. Additionally, the ship’s Champagne Bar has been given a facelift – the new R Bar is a sophisticated 60s-inspired cocktail bar. The ship will reposition from Singapore to Sydney before the 2014-2015 cruise season. This repositioning cruise will be one of the first opportunities for passengers to enjoy the fantastic new Voyager of the Seas. The ships will spend much of the 2014-2015 summer season cruising around New Zealand and the South Pacific. 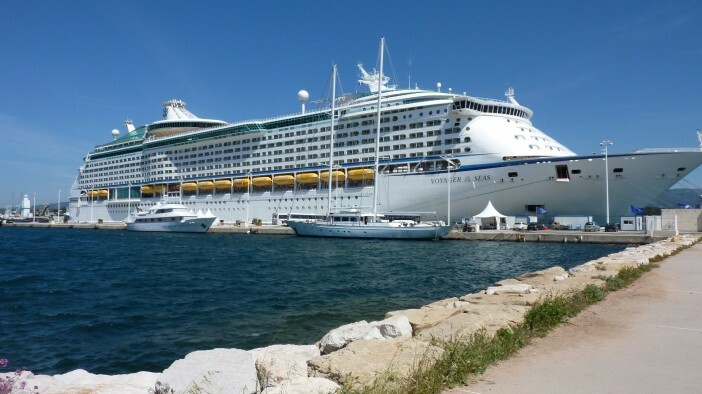 Cruise1st has excellent deals for cabins on this repositioning cruise, here, and a full selection of other holidays on our dedicated Voyager of the Seas page. Image sourced via Flickr Creative Commons and Royal Caribbean Press Center. Credit: Walter Lim and Royal Caribbean Cruises.